Today's train departs at 10:00 AM from Rutland. After breakfast, with a couple of hours free to explore, Chris and I drove to the locomotive yard, location of the former car shop building, to see what was there. VTR 303, GP40-2, EMD #776025-15, build date 12/77. VTR 308, GP40-2, EMD # 776025-4, build date 12/77. GMTX 2208, GP38-2, EMD #7354-17, build date 5/72. Next it was a short drive to Otter Creek. Otter Creek forms on the western slopes of Mt. Tabor and flows southwesterly into the town of Dorset towards East Dorset. There, it turns northward through the City of Rutland and then Proctor. It eventually empties into Lake Champlain at Ferrisburgh. Otter Creek is the longest river in Vermont at more than 110 miles, and Rutland Railroad predecessors used its route for much of their construction. The name Otter Creek comes from its original French name "La Riviere aux Loutres" which means river of otters. James Mead arrived at these falls on Otter Creek in 1769, making him the first recognized settler of Rutland. He and his family were given shelter by members of the Caughnawaga tribe while they finished their log cabin. Meed soon built saw and grist mills on the falls and ran a ferry on the Otter Creek. By 1759, the Crown Point Military Road passed through this area, and in 1778, Fort Ranger was built on the bluff northeast of the falls, known as Mead's Falls at the time. Our next stop was just around the corner. Center Rutland. Center Rutland Depot looking toward City of Rutland. This line goes west to Whitehall, NY. Center Rutland is the junction between the former D & H line west to Whitehall, NY and north along the former Rutland Railroad to Burlington, VT. Between the two lines is the old Rutland Railroad train station. Built as a railroad depot in 1912, the Center Rutland Depot is a recognized historical landmark. A unique characteristic of the station is that it has a bay window for an agent on each side of the building, as both the D&H and Rutland used the station. The station was last used by the railroad in 1961. The depot is now a museum operated by the Rutland Railway Association and the Rutland Railroad Museum and Model Railroad Club. Bridge over Otter Creek on the way to Whitehall, NY. This line goes to Burlington, VT.
And soon the reason that we are here is answered. Approaching is the just departed Ethan Allen Express from Rutland. It was now time to head over to the station. The current passenger train station in Rutland serves regular Amtrak service and the occasional excursion train. 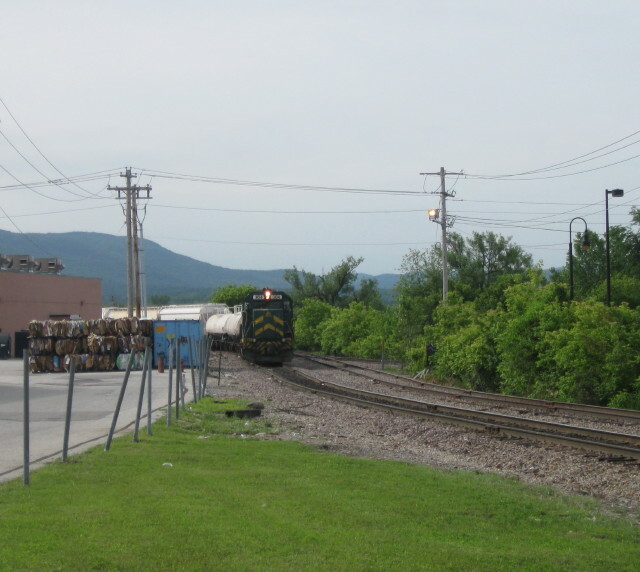 The Ethan Allen Express operates between Rutland and New York City on a daily basis. Opened in 1999, the station is located at the northwest end of the Rutland Plaza Shopping Center, near the location of the summer farmers market. The Amtrak station, which features an enclosed waiting room but no ticket office or Quik-Trak kiosk, has been named the "James M. Jeffords Rail Passenger Welcome Center" to honor the late Senator Jim Jeffords of Vermont. United States Post Office and Courthouse. We watched the train activity coming and going while waiting for our train to arrive. GMRC 304, GP40, EMD # 36737, built date 2/71. Local stones next to parking lot. VTR 311, GP40-21W, GMDD #A3457, built 5/76. 50th Anniversary painted loco. VTR 301, gp40, EMD #33098, built 5/67. This will be the power set for our train today. At 10:00AM, after everyone was boarded and settled in, our train departed Rutland for Burlington and Lake Champlain. Just north of Center Rutland, the railroad bridges over Highway 4A using a 130-foot long through plate girder bridge built in 1959. Happy riders inside my car today, #280 Combine. Coach-Combine #280 started as Central Railroad of New Jersey (CNJ) #299, a baggage-coach combine used to deliver company shipments and newspapers along its routes. The car was built in 1925 by Standard Steel Car Co. When retired, it went to Nelson Blount's Monadnock, Steamtown & Northern Amusements (8/18/67), and then the Green Mountain Railroad (3/12/68) as their #280. It seats 48 in walkover coach seating. The baggage section in 22 feet long. MP 60.50 Proctor - The town of Proctor was originally called Sutherland Falls, named after where Otter Creek tumbles down about 122 feet. The first marble quarry opened here in 1837, but a lack of access to markets kept the quarries small and serving only local needs. However, the railroads arrived in the early 1850s, and the quarries and mills were rebuilt and reorganized as the Sutherland Falls Marble Company. A major change occurred in 1870 when Redfield Proctor of Proctorsville came to town to manage the company. In 1880, Sutherland Falls Marble merged with the Rutland Marble Company to form the Vermont Marble Company, with Redfield Proctor running the company. The town was incorporated in 1886 and named for Redfield Proctor. For many years, Proctor was the base of operations for much of the regional marble industry. The town was full of mills and the railroads daily hauled out many carloads of the stone. Marble was so plentiful that much of the town is built from it. However, the closing of the marble quarries in the town in the 1980s and 1990s cost the area many jobs, and Proctor has struggled much more than its neighbors. The population of Proctor was 1,741 aat the 2010 census. Located in the former Vermont Marble Company marble manufacturing shed is the Vermont Marble Museum, founded by the company in 1936. The Museum occupies about half of the complex, a series of connected factory buildings extending along the railroad at the center of town. MP 64.10 Pittsford - Pittsford, originally Pitts' Ford, was named for William Pitt, 1st Earl of Chatham and Prime Minister of Britain. He led the government during the French and Indian War, and was a supporter of the American position before the American Revolution. The town was first settled as a frontier town in 1769. During the Revolutionary War, American forces built Fort Mott here in 1777 and Fort Vengeance in 1780. One of the highlights of Pittsford is the New England Maple Museum. MP 65.10 Florence - A siding here is just a five mile industrial lead to the biggest customer on the entire Vermont Rail System. At the end of the track is OMYA Inc, - Verpol Plant. This plant is large and manufactures products for the paper, paint and plastics industries. The plant is capable of producing dry and slurry products, and much of it is shipped out in tank cars, especially a limestone slurry. Covered hoppers are used for dry pulverized limestone. We'll get a closer look on tomorrow's train ride. Vermont cheese in the works. Getting ready for the photo runby. Business car Macintyre with open platform. It was just past 2 pm when we all got our first glimpse of the very beautiful Lake Champlain. New York State on the far side. MP 121.4 Burlington Yard - Burlington Yard is squeezed between Maple St on the north and Flynn Av on the south. In between is the former Burlington Yard Drawbridge which crosses a canal into Lake Champlain. There was a water station here in 1949. During the steam days, Burlington was shown to have two 50,000 gallon water tanks, with a daily demand of 100,000 gallons. Today, there is a brick 7-bay roundhouse and turntable to the west. This facility handles all major locomotive repairs and inspections for the VRS. Further to the west are the corporate offices of the Vermont Rail System, located on the shore of Lake Champlain. MP 121.8 Burlington is the largest city in Vermont and the shire town of Chittenden County. The actual population of the city is just less than 50,000, but the metropolitan area is about one-quarter million. Burlington's setting on Lake Champlain has won it many awards, including one of the prettiest towns in American in 2010 by Forbes magazine and one of the top four places to "watch" in the United States in 2007 by AARP. Educational opportunities abound here. - it is the home of the University of Vermont, Burlington College, and Champlain College. For dessert fans, Ben & Jerry's was founded in Burlington in a renovated gas station. Burlington is situated on the eastern shore of Lake Champlain at an elevation of 109 feet. Over the years, Burlington has changed from a transportation center to a manufacturing center, but like many northeastern cities, saw a major decline in manufacturing during the late 1900s. Today, its economy is based upon education, health services, tourism, and consumer sales. There is still a limited amount of manufacturing. Our arrival in Burlington should definitely be qualified, if not awarded, the fickle finger of fate. The city leaders decided today would be a good time to paint the bike path in the city. As the bike path goes by Union Station, it is also the loading platform for passenger trains. So on the day the first passenger train to arrive and use the platform in nearly three decades was also a good day to paint the platform. Our arrival was delayed some to let the paint dry before the passengers stepped foot on it. After we arrived we sat for awhile in the cars as the powers to be decided where we could safely disembark. While waiting we all saw a worker drop a big can of paint that resulted in a huge mess. Green paint on the building walls and everywhere. That followed with the entire crew working feverishly to mop and clean up. Once a dry and safe path was found we were able to disembark. First I went to nearby hot dog stand for a dog and drink. Then it was off to do some exploring of the Burlington Waterfront. My first stop was at ECHO, Leahy Center for Lake Champlain. There is a fee to enter the Center but the restrooms were free. So a quick stop here then back outside to explore. Click here for web site. Click back button on your browser to return to this page. Located here is the Burlington Community Boathouse with showers available for sailors. There is also a water front restaurant. Splash at the Boathouse. A restaurant with a great view. Photo of author taken by a kind stranger. Leaving the waterfront I walked up College St to see more sites. Units with a view of the marina a block away. Continuing east on College St to Battery St then hanging a right to go south on Battery St to Main St and then around the corner to Union Station. This reminds me of space ships from cartoons of the 1930's. Instrument panel inside the space craft. Waiting room inside Union Station. Our train at rest at the Union Station platform. Notice the freshly painted green bike path. Our locomotive power waiting to be connected to our consist and our trip back to Rutland. We departed at our scheduled 4 PM time for our return to Rutland. MP 87.85 Middlebury - Middlebury was one of a number of New Hampshire Grants chartered by Colonial Governor Benning Wentworth, this one on November 2, 1761. At the time, the French and Indian War was underway and the area was a scene of constant combat, so settlement was delayed until 1766 when John Chipman began clearing land. By the time of the Revolutionary War, Middlebury had grown to include several sizeable villages and was one of the targets of Carleton's Raid. On November 6, 1778, much of the town was burned, but settlers returned and rebuilt after the war. The establishment of Middlebury College in 1800, the first college in Vermont and today one of the elite liberal arts colleges in the country, made Middlebury even more important. By the early 1800's, industries such as a cotton factory, sawmill, gristmill, pail factory, paper mill, woolen factory, iron foundry and marble quarry were located in the area, and Middlebury was the second largest town in Vermont in 1830. From 1821 to 1825, John Deere apprenticed at an area blacksmith shop. Born in Rutland in 1804, his parents moved to Middlebury the next year where he grew up. When hard times hit the region in the 1830's, Deere decided to leave his wife and family temporarily and venture west. In 1836, Deere moved to Grand Detour, Illinois where in 1837 he built the world's first steel moldboard plow that led to the international company that still uses his name. Also located in Middlebury is the 118,000 square foot facility of Connor Homes. Several seasons ago on the PBS series This Old House, Connor Homes was featured building a new home in their facility for the show. The show went to the facility and showed what all is involved in building a house indoors. This seems to be a growing trend in new home building. Better construction indoors and less waste on the job site. Of course, Sears was selling homes from a catalog over a hundred years ago. I enjoyed that season's show and found it to be interesting and informative. Click here for Connor Homes. Click back button on your browser to return to this page. The bridge is closed to vehicle traffic, but visitors can walk through it. MP 60.50 Proctor - This was our last stop and final photo run by of the day. I disembarked and was able to take photos of our train and some of the interesting buildings here in Proctor. Coach #1306 was built by Pressed Steel Car Company in 1930. It seats 74 in walkover coach seating. Click here for Vermont Marble Museum. Click back button on your browser to return to this page. These buildings utilize local and plentiful supplies and materials. After completing our photo runby, we boarded our train and continued to Rutland. We arrived in Rutland close to our scheduled arrival time of 8:00PM. From there Chris and I made a supper stop at KFC and took it back to the motel room to relax and get ready for tomorrow's adventure to the large OMYA mining plant.